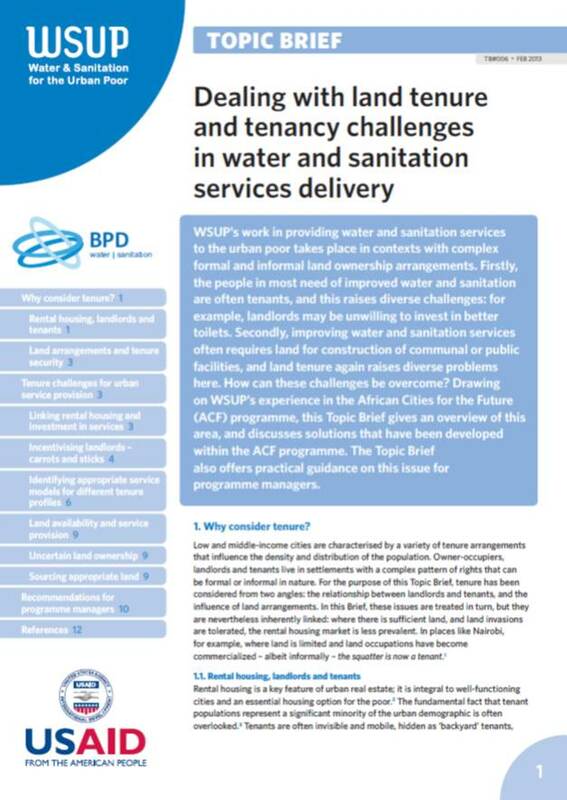 WSUP’s work takes place in urban contexts with complex formal and informal land ownership arrangements, raising diverse challenges for water and sanitation service provision. For example, the people in most need of improved water and sanitation are often tenants, yet landlords may be unwilling to invest in better toilets. Similarly, improving these services often requires land for construction of communal or public facilities, raising the issue of land tenure. Drawing on WSUP’s experience in the African Cities for the Future (ACF) programme, this Topic Brief gives an overview of these challenges and discusses possible solutions. Thank you for downloading our report! For regular updates on our latest resources, you can sign up to our newsletter.